Any remodeling project starts with a little bit of dreaming and a lot of planning. Finishing your basement requires additional consideration of some very important construction details, even before you get to thoughts of how the room will look. At T&K Contractors, we’re experienced in basement remodeling and have helped many homeowners visualize all the possibilities of their basement space, and then bring those dreams to reality. So, before you think about how much built-in storage you need or where to put the wet bar and TV, there are 5 things we know your basement remodeling plan needs to address before construction begins. Often, the most challenging thing to deal with in finishing a basement is the presence of moisture. We want to make sure that the basement is and will remain dry before adding any new building materials to the space. That means checking to make sure there aren’t any existing problems with moisture damage or mold that need remediation, and that the foundation is checked for places where it might leak. Once we know the space will stay dry, we can proceed with making it a great living space for your family. No matter the age of your home, if the basement is unfinished it probably doesn’t have the proper plumbing in place for you to use the space for your kids to play or to entertain guests. To add a full bath, or even a powder room, plumbing needs to be added that will not only bring hot and cold running water to the bath, but also pump the waste water up and out of the below-ground space. Basements typically have challenges such as low ceilings, small windows and poor natural lighting. Adding large windows to let in more natural light, as you might do in a family room, usually isn’t an option. Some extra planning is needed to create a brighter space. Well-placed recessed ceiling light fixtures supplemented with other task lighting and ambient light sources can make the space warm and welcoming. Temperature and moisture are two things that limit your choices of flooring in a basement. While a cool floor might sound nice on a hot, humid summer day, it’s not so nice in the middle of winter when your kids need to stay indoors to play. Typically, hardwood floors are not recommended for use in basements. However, engineered wood or luxury vinyl plank (LVP) in combination with area rugs work very well. Wall-to-wall carpeting is also a good choice for warmth and provides some sound absorption. And finally, we recommend insulating the floor and exterior walls as a means of maintaining a comfortable temperature and controlling condensation. The word “egress” comes up without fail when discussing a basement remodel. Building and fire codes require you to have a way, other than the stairway to the first floor, to get out of that basement in an emergency. If your house and property allow for a walk-out basement door, your problem is solved. But if it is all below grade, you need an “egress window” that opens and meets local code for size and location. There are special basement egress windows that include built-in steps and a window well that allow someone to climb up and out safely. Once we’ve solved these issues, let’s explore the possibilities! Start with how you’d like to use the space and be as specific as possible. 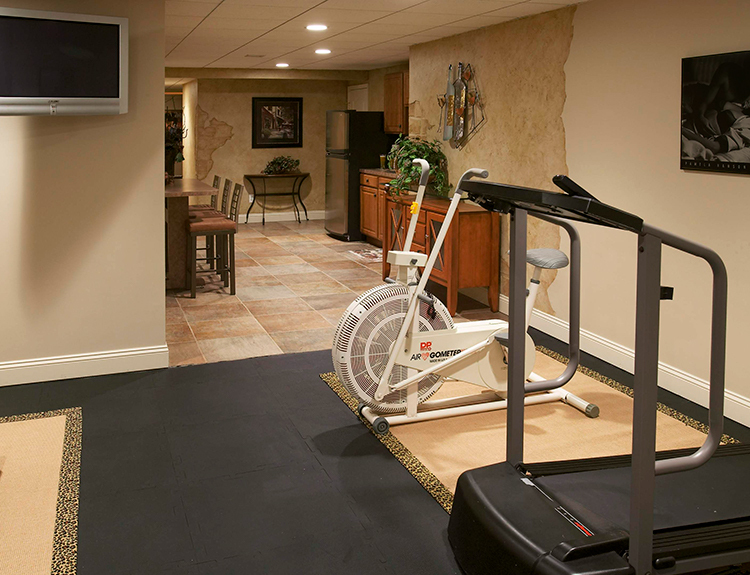 A media room, for example, will have a different layout, design, lighting, and wiring than a home gym. Maybe you want a wine cellar, cozy family room, or home office. If storage is needed, the right solution for storing kids’ toys and games will be different than the storage needed for holiday decorations that are only accessed once a year. If you are looking for more elbow room in your home, just look down to your basement. Finishing it to meet your family’s needs is one of the most cost-effective ways to increase the usable space in your home. Call us today and we can take a look, and help you discover all the basement remodeling possibilities waiting for you.